Established as an artists’ colony in 1908, Beaux Arts Village is an Eastside town that sits along the eastern shores of Lake Washington in King County just north of the I-90 floating bridges and Bellevue’s Enatai neighborhood. One of the smallest towns in the county at just .1 square miles, the village is nestled away from the traffic, offering a small-town feel that makes it seems as if its miles from city life, yet it’s just a minute from the interstate, for a 15-minute commute to downtown Seattle, and just 5 minutes from downtown Bellevue. Those who own Beaux Arts Village waterfront property can look forward to being in one of the most stunning surroundings in the region, including expansive lake views and the boats that pass by, downtown Bellevue and the Seattle skyline, while Mount Rainier towers over it all. You’ll also be able to watch for the wealth of wildlife that passes by, including bald eagles and herons. 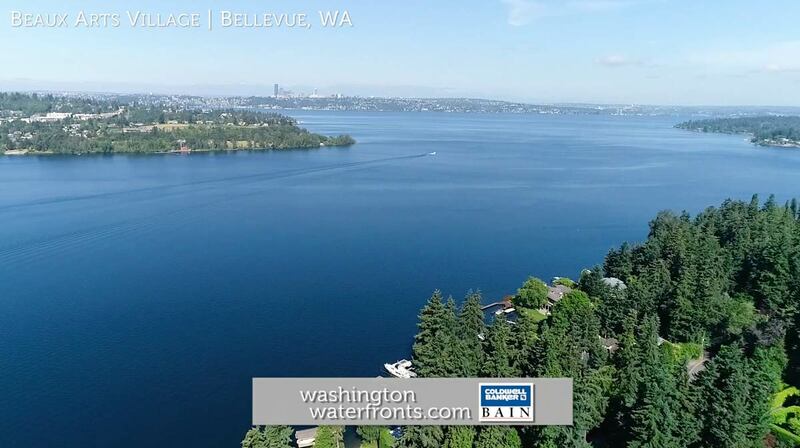 While some Beaux Arts Village waterfront real estate owners may have their own stretch of sand and even a boat launch, the community itself hosts a private beach for residents and their guests that includes 1,100 feet of Lake Washington shoreline. Enatai Beach Park is likely to be within walking distance and offers a swimming area, dock, boat house, picnic area, biking paths and seasonal kayak and canoe rentals. Mercer Slough Nature Park is just 5 minutes away and provides guided canoe tours, walking trails and a blueberry farm. All of this, yet the world-class dining, shopping, cultural attractions and entertainment in Bellevue is just minutes away. Beaux Arts Village waterfront real estate includes an eclectic mix of vintage and new, modern homes set along narrow, tree-lined streets with most enjoying lots of privacy and many featuring large or even floor-to-ceiling windows for enjoying those vistas from inside and out. Take advantage of our industry-leading tools to make your property search as easy as it possible and be sure to register for a FREE account so that you can receive email alerts whenever new Beaux Arts Village real estate for sale hits the market. If you’re seeking to sell your Beaux Arts Village property, contact our Waterfront Specialists directly for a comprehensive listing analysis and to learn more about the cutting-edge marketing strategies we’ll use to sell your home quickly for top dollar!